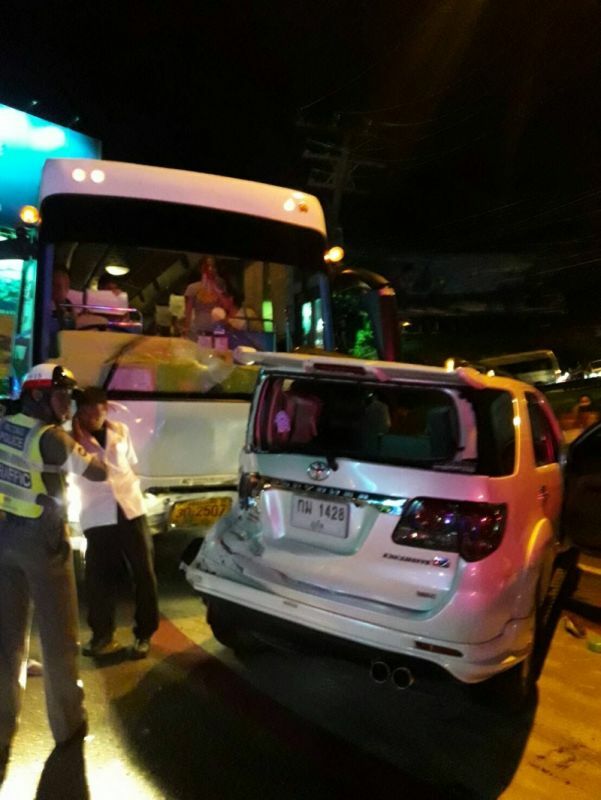 PHUKET: A Phuket tour bus carrying 30 Chinese tourists back to their hotel in Patong suffered a reported brake failure at the bottom of Patong Hill yesterday evening (April 13), causing a five-car pile-up. The driver told police the brakes failed as the bus made the steep descent into Patong. Lt Col Maj Pattapee Srichai and fellow officers from the Patong Police arrived at the scene, in front of Wat Suwankhiriwong (Wat Patong), at 7:36pm. 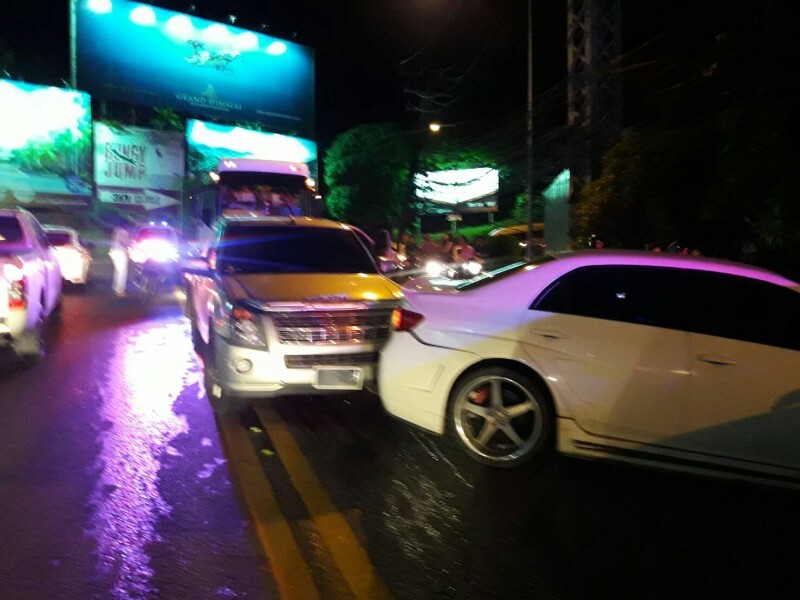 The white Mercedes-Benz bus, registered in Nakhon Ratchasima, rammed into the back of a white Toyota Fortuner, reported Col Pattapee. The Fortuner was then pummeled into a bronze Isuzu, causing an end-to-end chain reaction of one car being shunted into the back of another, he explained. Among the other cars damaged in the accident were another Isuzu pickup, a Toyota Altis and a Honda Jazz, he added. 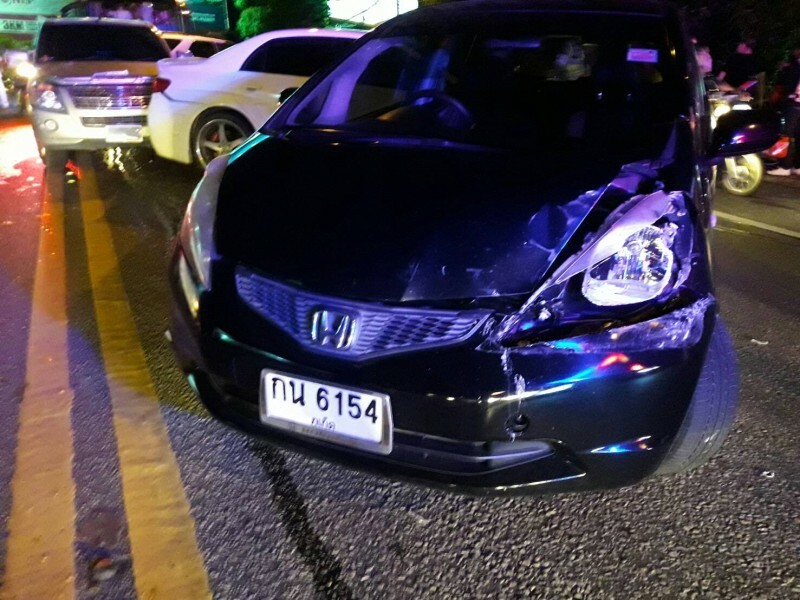 Rescue workers and ambulances from Patong Hospital also quickly arrived at the scene, and reported that only five people had sustained minor injuries in the pile-up. Officers took an hour to clear the damaged vehicles from the scene amid heavy traffic, which included long tailbacks all the way back over the hills to Kathu. 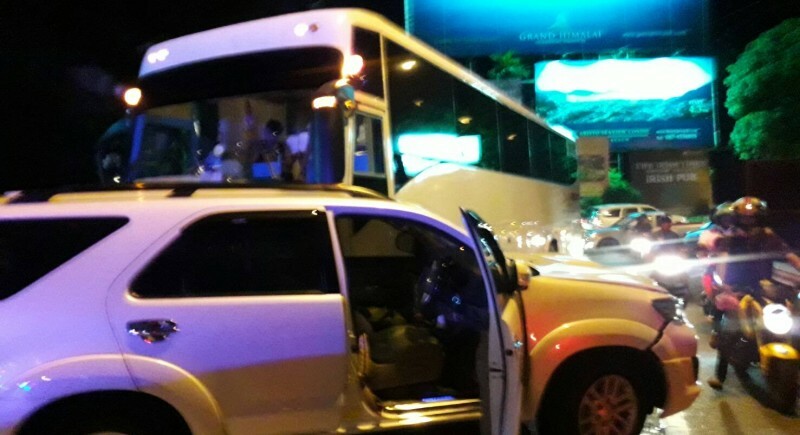 The bus, operated by Ningbo Yonglin Travel Co Ltd, was carrying 30 Chinese tourists and three guides from a restaurant near Chalong Bay Pier back to the Bauman Residence Hotel, in Sai Kaew Rd, when the accident happened, reported police. Officers have yet to conclude their investigation into the claims of brake failure and have yet to press any charges against the bus driver for the accident. Signs at the top of Patong hill should indicate "Low Gear Required for Bus & Trucks"
Signs along Patong Hill road should show image of bus or truck almost toppled over, ready to go over, precariously tilted on two wheels. Similar to how an Animal Crossing or Animal area sign alerts drivers to look out for them. May save some lives or injuries. Re: "Officers have yet to conclude their investigation...."
No need to investigate. The police need only consult the experts posting here, who apparently know exactly what happened and who is to blame. Ah, the old "brakes failed, mate" routine again. If the drivers learned how to drive properly and used a low gear down the hill instead of riding the brakes all the way down they wouldn't fail. Every vehicle that I follow down that hill has brake lights on all the way down. Hopeless ! Teach these guys how to drive !! This happens about 10 -15 times year. Old busses never properly inspected. Which is normally the case. tourist destination after all. LMFAO. Hahahaha, no brake failure, just a driver failure. The whole voyage the brakes were working well, right? Now 'technical' officers look into this repeating Patong Hill happening. Officers must have by now true skills to analyse this. When the day will come it are not the brakes but the drivers who not have any skills to drive hills?